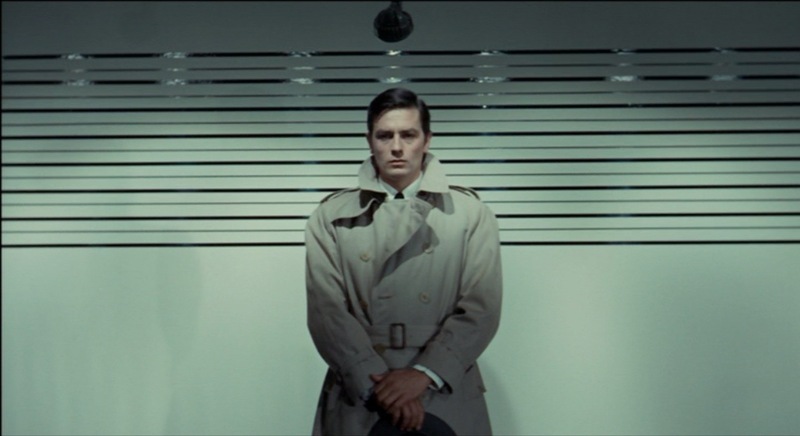 Jef Costello (Alain Delon), is a hitman who lives alone and has very little human interaction or real relationships. It’s the code he lives by in order to remain professional. After completing his contract killing of a nightclub owner, Costello lets his guard down and is witnessed by one of the club’s singers. Before he knows it, he’s brought in by the police who suspect he’s guilty but don’t have the evidence to prove it. He’s released, but the police are on his trail and so are his employers who now see him as a liability. As the film opens we linger on a shot of a small desolate room containing very little furniture yet includes a birdcage and a bed. 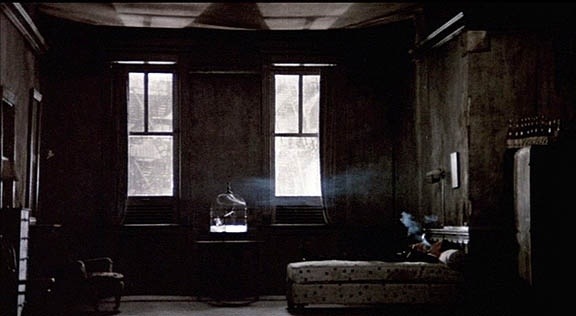 The room looks empty until you notice a man lying on the bed smoking a cigarette and saying nothing. 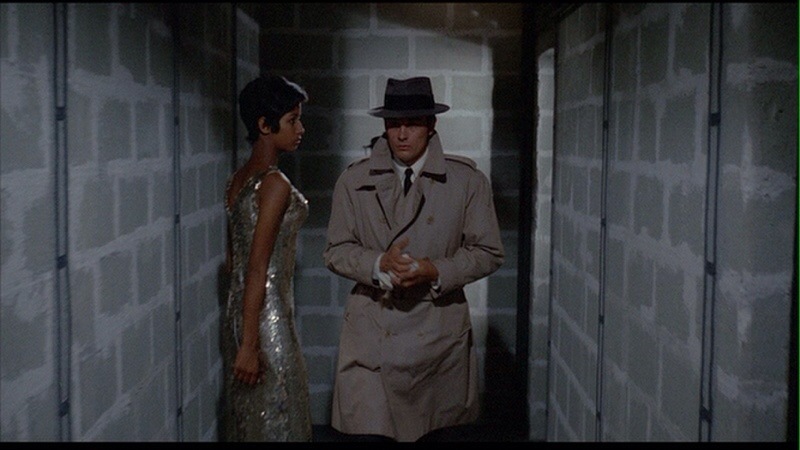 This opening shot alone, sets the tone for what is to come in Jean-Pierre Melville’s fastidious and incisive near masterpiece. Melville wastes no time on backstory or over explaining the plot. He also has an aversion to dialogue but a very high inclination on style and content. What dialogue there is, is short and to the point. Things are as they are, and that’s it. Although this might sound like there’s very little substance to be had here, that couldn’t be farther from the truth. Despite, Melville’s minimalist approach, the film is awash with symbolism and a deep existential core. This is a director that paved the way for French New Wave cinema, but when you look at his work here, you realise he wasn’t as flashy as, say, Jean Luc Goddard or as disjunctive as Francois Truffaut. Melville opts more for restraint and meticulous detail. It’s here that he’s served perfectly in his leading man Alain Delon. Very rarely have I seen an actor do (and say) practically nothing yet remain so magnetic. Delon is absolutely superb and one of cinema’s quintessential and most compelling anti-hero’s. Despite the obvious restraint from cast and crew, though, the film’s not without it’s moments of masterfully crafted tension. A exchange with the police as they try to identify Costello in a line-up is drawn out and quietly suspenseful and the same goes for a brilliantly constructed chase on the French metro – which has influenced such directors as William Friedkin in “The French Connection” or Brian De Palma in “Carlito’s Way”. But again, Melville and Delon never overplay it. The tension is purely built on a sense of realism and grows from their reservation and seemingly stoic approach. 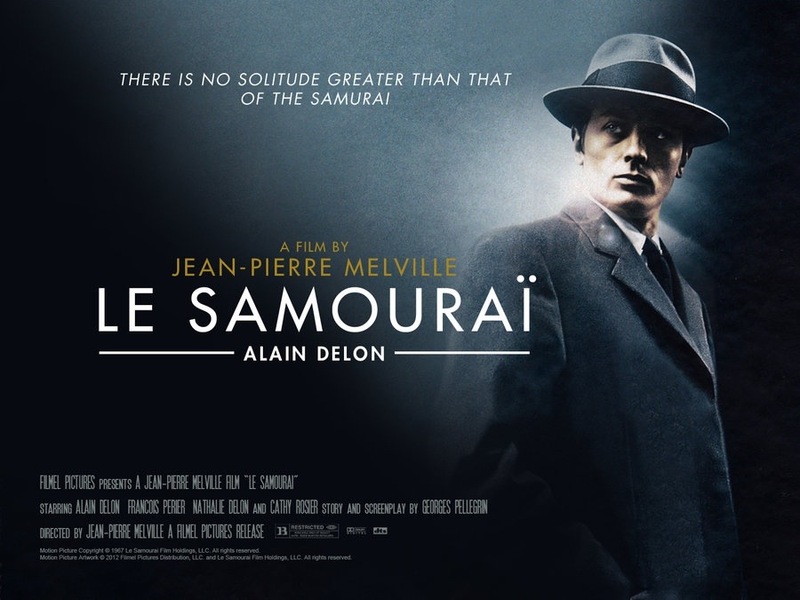 When you break “Le Samouraï” down a little, you’ll see the inspiration that it’s had on many films since; directors Jim Jarmusch and John Woo have openly declared the effect it had on them and their films “Ghost Dog: Way of the Samurai” and “The Killer”, respectively. Even Quentin Tarantino has claimed it to be his favourite gangster film. It’s easy to see why this postmodern, art-house, thriller has appealed and influenced so many filmmakers, as Melville manages to seamlessly blend Western crime folklore with the traditions and warrior codes of the East. He gives it that classic noir look and feel that was so prevalent in the American movies of the 30’s and 40’s and his vision of Paris’ underworld (in desaturated colour) echoes that of American noir in his use of nightclubs, enigmatic jazz singers and dark streets and alleyways that reflect an almost war ravaged city. Tarantino himself, is guilty of moulding a generation of crime loving cinema goers who expect gratuitous violence and have a propensity for fast talking mobsters. However, when you look back at the stylish and meditative work of Melville, you realise that in order to capture an audience’s attention, you don’t have to have Mexican standoff’s or be talking about Big Kahuna burgers or getting medieval on people’s asses with a pair of pliers and a blowtorch. Simplicity can work just as well. 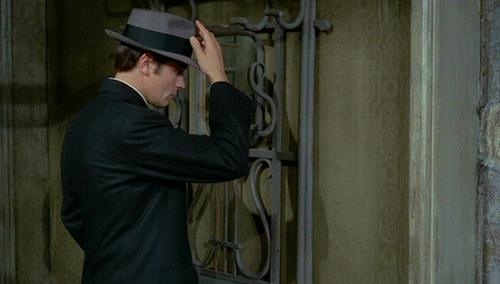 Trivia: According to Rui Nogueira (author of the book “Melville on Melville” published in 1976), the caged bird shown as Jef Costello’s pet in “Le Samourai” was the only casualty of the fire that destroyed Melville’s studio in 1967. This entry was posted on December 19, 2013 at 12:30 pm and is filed under Crime, Film-Noir, Foreign Language, thriller with tags 1967. You can follow any responses to this entry through the RSS 2.0 feed. You can leave a response, or trackback from your own site. As you may know I love French cinema and this is one of my favorites. I gave it the same score. In fact it happens to be one of the movies that’s on my Christmas list. Hoping my wife comes through on this one. 😉 Great movie! I think she has it. Not certain but we got a mysterious package in a few days ago that just might be Le Samourai! By the way, do you have a review done? Can’t remember if I read it or not but I’ll swing by if you have. Sweet. I know only a handful of French films, certainly a goal of mine to fix. I will add this to the top of my list! Great review, Mark. Thanks Cindy. I love French cinema. I think it’s one of the most creative and consistent from any nation and this is up there with some of the finest. I keep meaning to see this, year after year, and then keep forgetting. I love, love, love Ghost Dog, so I figure this, the one to which Ghost Dog pays so much homage, must also be good. And then I forget about this one. Now I’m going to change that. Thank you for the reminder! Cheers James. If you love Ghost Dog (as did I) you should find plenty to admire here. There’s no doubt that this was a heavy influence on Jarmusch. Great spotlight, Mark. I’d only add this splendid film was a direct influence on Walter Hill’s THE DRIVER, too. Thanks Michael! And I totally agree with you there. Even the enigmatic and loner nature of Jef Costello is reminiscent of Ryan Gosling’s character in DRIVE. Such a fantastic and highly influential film. This is such a cool film. I love the style and the restraint that you mention. This just enhances the tension when the action picks up and makes for such an engaging movie. It definitely influenced a lot of newer films, especially Ghost Dog. Yeah, there’s no doubt that this has influenced so many with Ghost Dog and The Killer being the most obvious ones. All three are still fantastic films in their own right but this is the original and best, though. Thanks Dan! Nothing like a bit of Xmas viewing eh? Ashamed to say I still haven’t caught this but thanks for giving me every reason to do so Mark. Ha! Yeah, while others are exploring and indulging their Xmas spirit, I’m delving into meditative art-house LOL. Great film though, Mark. Well worth catching. Great post Mark, you have got me intrigued about this film. Mark I couldn’t help but compare this to Leon the Professional; you know the isolated, emotionless hitman with a colorless bare home. How alike are the two films? Well pointed out, Chris. They certainly share similarities in terms of the main character. Like I say in my review, though, the influence this has had on films and directors is pretty extensive. Excellent post Mark, I’ve been meaning to watch this for ages. This review has given me the final push to finally see it. Knowing how you like your world cinema, Vinnie, I think you’ll take a lot from this. Definitely give a go! Nice review. I haven’t caught this as well like some other commenters but I’ve been meaning to see this for the longest time. 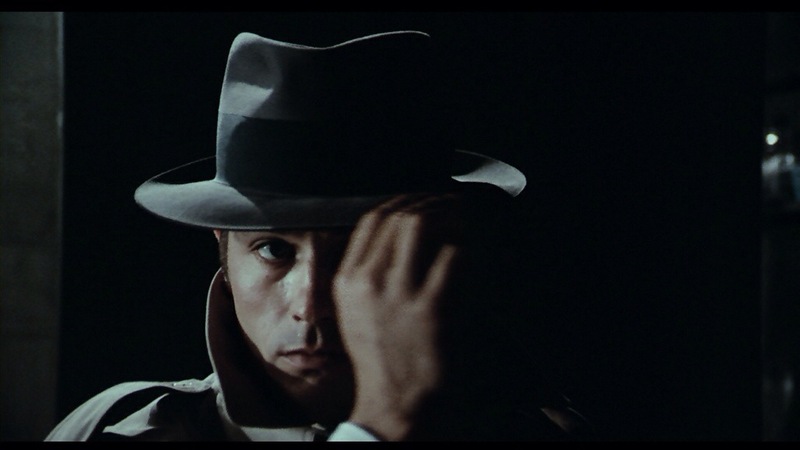 I’ve always liked crime movies, so I’ll have to catch Le Samourai soon. I was the same, man. This had been on my ‘to see’ list for years and that’s me just getting round to it. It was worth the wait, though. Fantastic film and damn near perfect. Cracking review Mark – I watched this a while back after Tarantino waxed lyrical about it – interesting to read of the other directors it has influenced…some obviously, some less so obviously. It’s one of the coolest gangster films. Cheers Stu. There’s no doubt that it’s one of the coolest of it’s kind but it really is quite surprising how many films have taken from it. I know directors are always influenced by others but this had had quite an effect on so many films. Great review mate. Not one I’m familiar with but sounds really intriguing. Definitely sounds like something I’d really enjoy. Cheers Chris. It’s definitely worth seeking out. I kept hearing about it for years but it took me ages to get around to it. Glad I did, though. It’s was brilliant. Watched this a couple of years ago and thought it was a really nice movie. Loved the atmosphere in it. Nice review, Mark. I haven’t seen this film in a long while. Need to re-visit it. Such an influential film and so many directors (especially De Palma) have cited this movie as a springboard, visually, for it’s mood and tone. Good job! This one was a nice surprise, Mark! Thanks for stopping by to check it out Vic. This was the first time I’d seen it. I’d heard so much about it beforehand and I have to say, it lived up to it. Great movie and very easy to see how influential it’s been. It’s one I think I will keep going back to. Cheers man! site is actually nice and the users are actually sharing pleasant thoughts.